"Yeah, I'm the janitor. I'mma clean your clock." Finally a new Duel Cafe comic! Sadly, I haven't had time to work on any of these, but one day this week, I squeezed it in before work! 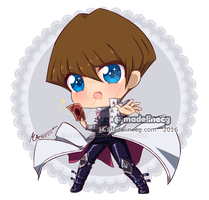 Great to see these Duelist Cafe comics from you again. I was wondering when you were going to be doing these again. They are so great when you do them. Hehehehe...love that Jounouchi is the janitor. Works so well for that line he says in the anime. 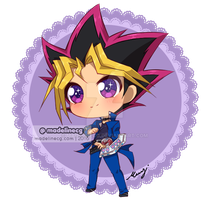 Hmmm...I wonder where Yami and Yuugi are? Maybe out doing something. I love Shizuka's outfit and Jounouchi's suits him well. Nicce work. Thanks! They're fun to do; I just haven't had much of a chance to finish up any of the ones I've sketched out, except for this one. Hopefully I can finish some others soon! You're welcome. I understand and I hope you will be able to finish more of them soon. Of course and that they are quite popular. Cheapest? I'm sure that Jounouchi would not enjoy you saying that. That guy is going to regret challenging Joey, he doesn't look like he's in the mood. And Serenity looks so cute in her maid outfit! It suits her!